Susan Rae was elected as Councillor for Leith Walk in May 2017. This is her first speech to Scottish Greens conference given on 21st October. Good Morning Conference and Welcome to Edinburgh: birthplace of the Scottish Enlightenment, where our greatest thinkers, philosophers, scientists and economists strove to expand all fields of knowledge to benefit both individuals and our society. What better place to hold a Conference. I extend a special welcome to our guests, Claire Bailey, formerly Deputy Leader of the Green Party in Northern Ireland, now Member of the Northern Ireland Legislative Assembly. 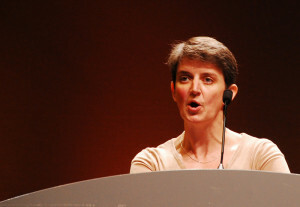 Thanks to Claire, the Greens of Northern Ireland became the first pro-choice party in that Assembly. I also welcome Swedish Minister Per Bolund, whose innovative approach to low carbon economics helped shape Sweden’s path away from fossil fuels, and delivered significant social and infrastructural change. Thank you all for joining us today and I urge you to take full advantage of all that Conference has to offer. Join in our workshops, engage in our debates and our fringe meetings: take time to visit the stalls and speak to stall holders. Speak to each other. Learn from each other. Expand your knowledge and use it to help shape our Party’s future. But most of all, enjoy your Conference experience. It’s been five and a half months since the local government elections when, with the help of a network of extraordinary dedicated local teams, our Party succeeded in increasing the number of councillors across Scotland. To all of those campaigners, the leaflet deliverers, the strategists, the stall runners, the data keepers, the fundraisers and our tireless Party staff, I would like to say an enormous and heartfelt thank you. Sadly, many talented excellent candidates who worked so hard did not manage to cross the line this time. To those candidates, and to those who sadly lost their seats please note. You are on a break. Enjoy it. Then buckle up because we fully intend to bring you back. 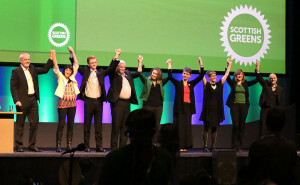 After the exhilaration and giddy excitement of the election, Scottish Greens took their seats, with our vision for a greener, bolder and fresh approach to local government to Councils across our country. And our challenge began: and we have made progress. In Glasgow and Edinburgh we look forward to rent pressure zones, we’ve fought period poverty, hate crime, sought low emission zones and are campaigning for radical change to housing and transport policies. In Orkney we are pushing on the UN Principles of Responsible Investment. In Stirling we are saving our landscape and in Aberdeenshire holding developers to their forgotten pledges to build play parks. Across the country Green Councillors are working in their wards helping constituents with the issues that affect them most and hit them hardest by supporting and empowering those individuals and their communities. The challenges we face, the budget cuts, staff cuts and the relentless frustrations of dealing with what can only be described as systemic apathy, can be fought, and as we have proved so far, can be won. However, the giddy joy of election for me, and many colleagues, was followed by the crushing disappointment of reality. I have staggered dizzily from meetings reeling from the heady scent of testosterone and searing eau’d’ambition. I’ve been frustrated by pervasive excuses designed to halt progress and rendered catatonic by relentless (and terribly tedious) mansplaining. I have walked through the beautifully carved doors of City Chamber meeting rooms and felt those doors are a portal to 1977, not 2017. I now know that in some Council Chambers we are dealing with egos so enormous that only a private office can contain them! I know my colleagues have felt similar, but when I have possibly naively, expressed shock or discontent, I am met invariably met with this response. Well Conference. It is not. Not a single Green Councillor, newly minted or veteran, signed up for business as usual. Not one signed up for accepting mediocrity over excellent. Not a single one of us signed up to embrace the status quo with unedifying gusto nor have we any intentions of doing so. We signed up to drive change so badly needed; to solve the problems created by our massive housing crisis, to improve education and social care, to preserve green spaces and parks, to protect our constituents facing hardship, to introduce innovative environmental projects and to build communities. We will settle for nothing less. Thankfully, at least in Edinburgh, I am delighted to report that a new influx of female councillors across parties are not for settling either. We have allies and we welcome them. But now I am making a plea to all of you. Right here and now to join us. Decide, this weekend, to be a Councillor. Make Conference the first step you take to joining us to help create the profound and essential change we need. 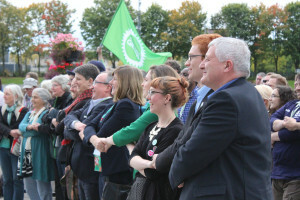 Local government is the vanguard of democracy and to protect that and to face the challenges of our uncertain future, Scotland needs Green Councillors in every single town hall. It needs the thinkers and the fighters. It needs expertise. It needs commitment. It needs every person in this room. As we begin to shape our next local government election campaign, let the first tenet of our strategy be this. Be a Councillor and be a damned good one. The shining light that is Muriel Spark once said, ‘Be on the alert to recognise your prime, whatever time of your life it may occur’. Conference, I welcome you to Edinburgh.